Picking Peter Bradley’s Birdbrain! – INDIE VOLT! You can imagine that we read ALOT of comics around the Indie Volt offices, that includes comic strips. Obviously, everyone knows Bill Watterson’s Calvin and Hobbes, or The Peanuts from Charles Shultz, we love those strips but on that very same list we enjoy, Rickard Jonasson’s 2GAG, Clint and Vexton from Jason McCormick and Beardo from Dan Dougherty. Recently we added another favorite to our must-read list, a masterful creation from artist Peter Bradley, Birdbrain! After silently stalking him online for months we worked up the courage to ask him for an interview, he did NOT disappoint! So how did you come up with the idea for Birdbrain? 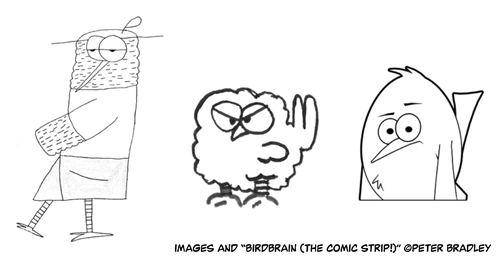 Peter Bradley’s Birdbrain from his first doodle to the character we love today! I was really big into GARFIELD as a kid. This was waaaay before the brand had become a merchandising juggernaut and there were only three or four compilation books released and maybe a small selection of stuffed toys available (oh… oh, God… I am so… so old). The concept of this thing called a “comic strip” just blew my mind and I wanted more than anything to be a cartoonist when I grew up. The first proto-Birdbrain was a mindless doodle at a Cub Scout meeting. It was a tall, gangly, bug-eyed, mosquito-faced bird (and I use that word VERY loosely, mind you) that, for some reason, I certainly didn’t intend at the time and I can’t for the life of me remember just why, was dressed like a pimp. Not long after, I reworked him into an almost blatant Garfield rip-off. He was a pet to a loser owner, spoke in thought bubbles, that sort of thing. I drew comics of this adorable little copyright infringement damned near constantly for years after that. Until one day I didn’t. And I continued to not draw him for almost 32 years. Then one absent-minded doodle later at coffee shop or where ever, there he was with the same judgmental stare from when I was a kid. And, well… here we are. Rumor has it that the newspapers are dying, the “Sunday funnies” are down to a two-page spread in major metropolitans papers, yet the comic strip as a medium is flourishing online, what do you think of that? 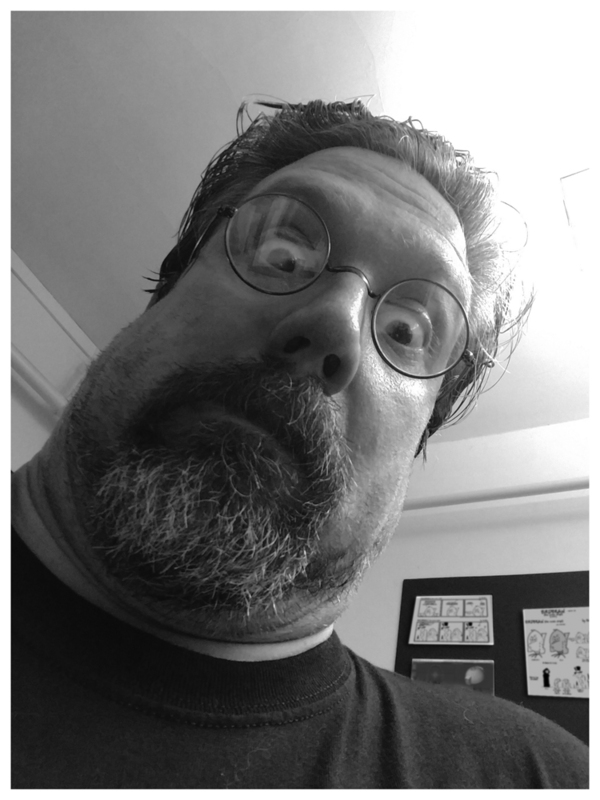 Is the future of the comic strip online? The newspaper industry as a whole has been in decline for years. Times (heh, newspaper pun) they are a-changin’ and people get their news and entertainment online and on demand and it’s changed the whole ballgame, for better or worse. And that’s just how it is. It’s, unfortunately, forcing industries to either adapt or die, but anything creative- art, music, film, poetry, photography… anyone can get their ideas out for the world to see with such ease thanks to social media. No need to go through a syndicates or publishers or studios anymore. Get the idea, create it, upload it, and promote the hell out of it. Why in the hell isn’t there a plush that I can sit on my desk? Are you pulling a Watterson, why are you denying the people Peter?! I just haven’t gotten to that point yet. Believe me, I want Birdbrain toys as much as the next guy (I’ll happily entertain offers to get some made, by the way. I’m looking at you, Hasbro). I’m not as stupid as I look, I’d sell out in a heartbeat. But, until then, can I interest you in a t-shirt? So what’s your routine like, I’ve heard of some comic strip artist who have a traditional routine when getting into the creative process? I put my pants on one leg at a time like anybody else. I can’t imagine that my routine is really anything out of the ordinary. I wake up, as any average person does, in a puddle of sweat from the night terrors and roll out of bed or off the couch or where ever I happened to be when the sweet grasp of unconsciousness took me, usually slightly after noon, with an empty bottle of Jack Daniels firmly clutched in each hand. After a breakfast of dry Corn Chex and mustard packets, I will usually scream at the furniture for several hours, angrily begging to know why Jonathan Lipniki just isn’t getting more work. Not getting any kind of reasonable answer, this will be the point in my day (well, anybody’s day, when you think about it) where I’ll decide whether or not to put on pants. Maybe I will, maybe I won’t. We’ll find out, I guess. Starring out the window and silently judging the neighbors for their choice of four-door sedan sitting in their driveway, half a cigarette in mouth and a lone banjo playing somewhere off in the distance, I decide that I’ll polish off that case of Pabst Blue Ribbon that I had been using to prop up my air conditioner and begin mumbling Neil Diamond lyrics face down into the near threadbare carpeting in the hallway. Hey? I don’t have a dog! Why is there a dog in here?! GET OUT, YOU MISERABLE, FLEABITTEN SON OF A…, my yelling trails off to a barely audible rendition of “Sweet Caroline” as I begin flailing my arms around like a man possessed and not realizing that what I believe to be a dog is actually a mildly underfed raccoon, only to trip and stumble over the empty beer cans, falling to the ground and frightening the poor animal out the broken screen door he entered through. A strip-like Birdbrain could start to slant very politically, you’ve avoided that so far, why is that? Politics today is VERY touchy and VERY divisive and I’d rather not navigate the minefield where you can violently upset people by making an off-handed comment about such-and-such-politician’s shoes. Besides, I simply don’t have the intelligence to get in that territory. I mean, you have to be completely on point to make competent commentary. Berkeley Breathed (BLOOM COUNTY) and Garry Trudeau (DOONESBURY) are great examples of doing it right. The artist/creator of Birdbrain Peter Bradley. 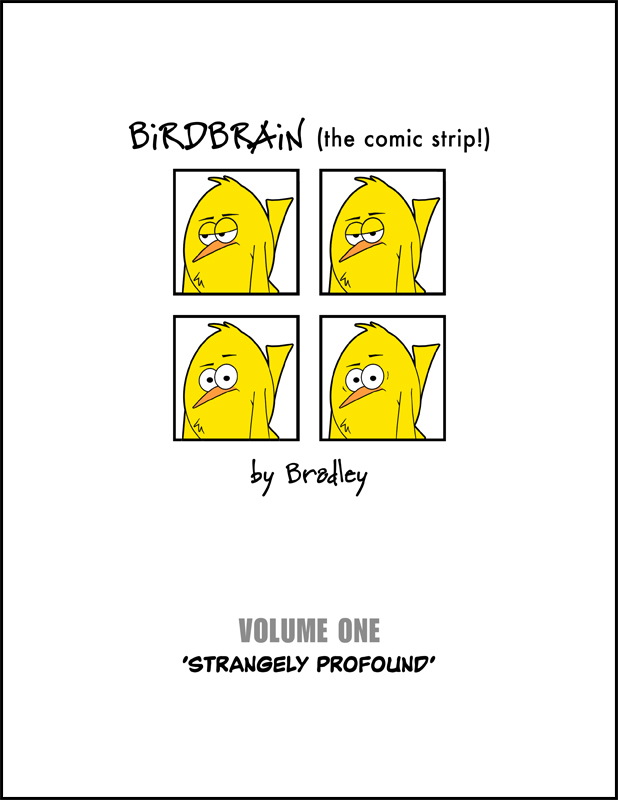 How long does it take you to get a birdbrain strip from concept to finished product? I can do a basic strip in about an hour and a full week at a leisurely pace in an afternoon. My hands shake far more than I’d like these days, so I can’t draw as well as I used to (my attempts to draw a straight line wind up looking like the EKG of a 4-year-old with a sugar high on Christmas morning). To get around that, I’ve set up each character as their own Photoshop document. I’ll turn layers on and off, move them as needed, copy, paste, lather, rinse repeat. I’ll also build props using 3D animation software (which I really enjoy the hell out of), which gives the art a unique look. I’ve also started using a tablet with some snazzy, brand new art software installed and a nice, heavy stylus which helps steady my hand. 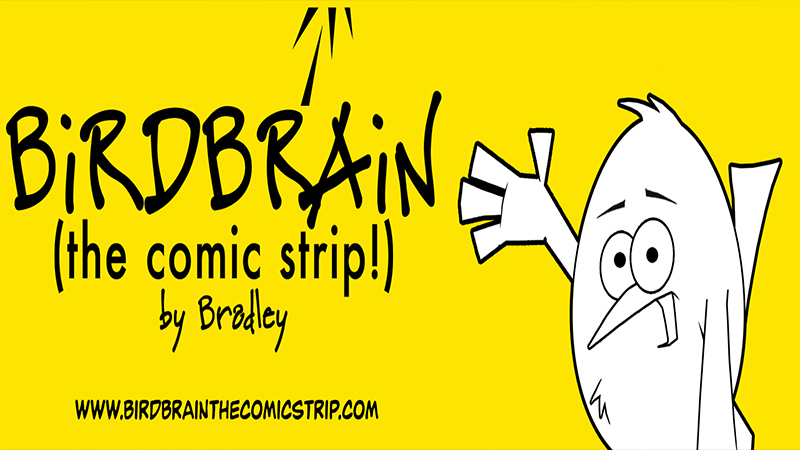 You’ve recently completed Birdbrain strip #100, what was that like for you? It surprised the hell out of me, honestly. It sort of came out of nowhere. My original intention was just to make a few and see what happened. But the ideas kept coming, so I kept going. I guess that little-feathered jerk isn’t done with me yet, cuz there’s more coming. Is there an end in sight for the strip? Should/when the end comes, I actually do have a final story scripted. A real tear-jerker, too (evil laughter). Are you going to send me a free Plush? You can stay up to date with Birdbrain by visiting the official Facebook HERE. Pick up the Birdbrain collection on Kindle and Amazon!